Ekona wrote: So daft question then, are you any good at SF2/3/4/5? I don't necessarily mean like ninja warrior good, but can you do all the super/hyper combos and the fancy stuff? I'm okay with pretty much any move from circa SF2T, but all these supers and hypers and whatevers are totally beyond me. I've never pulled on off (fnar) in anything other than a pure practice match. In the case of SFIII I remember that I was playing on a dodgy modded Xbox with a DVD drive that chewed up discs, so I ripped Street Fighter: Anniversary Collection to the hard drive whilst the disc was still in good shape, and consequently SFIII was one of the only things I played until I picked up a 360. Being a modded box I couldn't play online so I just had fun trying out the various characters (SFIII's cast of characters is actually hugely different to SFII or IV but again, I can familiarise myself with the basic special moves and supers to a point where I can have fun with a variety of characters). When SFIV came around I went from playing it on and off in between other games, to playing it much more when Super came out and having some decent win streaks in ranked matches, to losing a lot and deciding to play for fun again, going into casual lobbies rather than ranked battles. So yeah, I'm not all that good but I have a lot of fun playing. Even so, SFIV actually does a few good things to get people into the game; there are "trials" that teach you the motions for a few special moves, through to supers and ultras and increasingly complex combos (that I have trouble doing myself), so it caters for a variety of skill levels. I think the main reason I stick with it is because human competition is so unpredictable; you're trying to anticipate several moves ahead and get in the other guy's head and so you have people comparing it to hyperspeed chess I think if I only had offline play available I might have moved on to a different game. Cheers man, that's a great explanation, ta. I guess I probably need to devote some time to the training modes. And buy a PS4! An update for the beta came out recently, so Cammy and Birdie are now playable too. Birdie seems fun if a little gimmicky, and Cammy is Cammy. I also seem to be having better luck finding matches and things now, so hopefully when the full release comes around the netcode should be good enough. Another beta update went live today; the characters from the previous beta have been removed but new ones have been added in their place - Ken, Necali, Vega and R.Mika. I wasn't too interested in trying Ken and I've always been pretty bad with Vega, but Necali is new to the series and R.Mika hasn't been in an SF game for a while, so I spent quite a bit of time with these two. Necali feels a bit like T.Hawk from what I've played, with frontal and rising attacks (which can launch opponents into the air), but he also has a nice stomp move which pops an opponent up for a quick follow-up. He also has a great design and some really nice animation. Mika has some command grabs (character-specific throws that are executed with a particular command rather than the universal throw everyone has - for instance, Zangief's spinning piledriver is a command grab) and unique attacks but at the moment it's hard to know how to make the most of them. She does have an interesting gimmicky move where she does a pose that powers up her next throw - the more you hold the command, the longer the pose lasts and the more powerful the throw will be, and at the maximum level it does around 1300 damage (to put this into perspective, if Ryu starts the game with a full lifebar he has 1000 hp; other characters have different starting hp but generally they're all around 1000) - but the maximum level pose takes a long time to reach, and I only really see it being attainable in a match if the other guy's dropped the controller to go and answer the phone. How does the balancing feel? Still early, I know, but anyone standing out or does it feel about right? The reliability of the beta makes it a little hard to say because sometimes you can spend ages in training whilst waiting for a match, so you'll rarely have the feedback you get from human competition. The new beta's addition of AI training dummies helps a lot there, however. Personally I think Necali could be pretty scary in the hands of someone familiar with the character - if only because of the juggles, rising attacks and mobility - and I think Birdie has lots of gimmicky specials and far-reaching regular moves that could trip up players. So, R.Mika. Doesn't wear a lot, does she? As demonstrated at about 1m20s onwards, and that move at 1m30s... I'd be happy to die that way. But yeah, 4K footage for those of you with 4K monitors. Yeah, R.Mika's design is straight from the 90s, and it's pretty ludicrous and dumb and everything, but then so are so many other Street Fighter characters. I mean, this is the sequel to a game where a half-naked Turkish man covers himself in oil and squeezes opponents between his legs before they pop out at speed, so I don't think anyone expects them to shift to Virtua Fighter levels of sensibility any time soon. Thanks internet. In any case, the new characters introduced this week have been great and I'm looking forward to the full game much more now. So Karin's the final character to be added to the beta and she became available this morning - like R.Mika she's a returning character from the Alpha series, but her moveset is quite tricky to get to grips with. A lot of the special moves have follow-up attacks if you do specific commands immediately after the initial special move command, but the moves come out so fast that it took a while for my fingers to keep up with what I was supposed to be doing, and the special moves have different follow-up variants depending on the commands you use. With V-Trigger you have more moves with even more follow-ups, so it can get quite complex, but I imagine she's a satisfying character to use once you're familiar with everything. 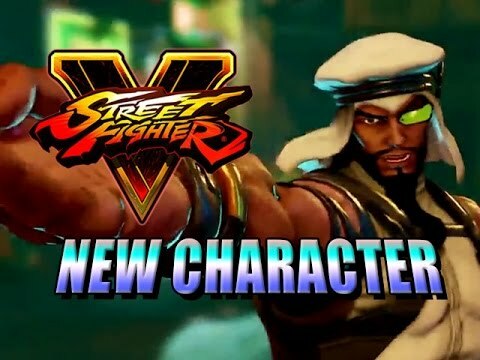 Beta 3 started today - new character Laura's been made available for players, and apparently Dhalsim and Zangief will be available later in the testing period. I'm really looking forward to trying Zangief as he was great fun in SFIV and I kind of want to know what pure grapple characters are like in SFV. Dhalsim and Zangief have been available today - Dhalsim has the same fire, flame and teleport moves as well as the familiar stretchy-limbed kicks and punches. The V-System things are some of the most gimmicky ones I've seen on a character, allowing Dhalsim to float around the stage for a limited time and set the ground on fire, draining the health of an opponent stood in the wrong place. Zangief has the lariats, spinning piledrivers and running grabs you'd expect, and his V-System allows him to absorb a certain number of attacks. Also, he's the first character I've tried with 360 commands (where you rotate the stick around in a circle and push a button for certain special moves) and I'm happy that it's just as lenient as SFIV was with its 360 commands - you don't have to rotate all the way around, so if your stick-swivelling isn't the best, it won't matter too much. Today is the last day of the beta, and in a surprisingly generous move all of the characters from the previous betas are unlocked to play in addition to the characters that were available over the past few days. This means that players can select all but one of the characters from the final game (that one character being Fang, who has never appeared in the beta), and consequently there's a lot of variety in matches now. How's the online holding up? Any issues with lag, or matchmaking now?